It's sunday afternoon and I'm munching organic corn chips and home-made guacamole from a beautiful mint green Fowler Ware bowl. Yesterday, we went to a most incredibly gorgeous wedding, and I just now finished sewing a dress and some skirts. It's warm, the cicadas are singing, and the kids are playing in bowls of water on the verandah. I'm feelin' good. So. The wedding. Megan and Ben. BEAUTIFUL!!! It was all so full of home-grown, heartfelt, organic goodness, you could feel the love with all your senses. It was outside on the grass, barefooted, kind of like a love picnic. It was an honour to have provided little bit of somethin' somethin', in the form of bunting, to contribute to the loveliness. In the wake of the embroidered pillow slips I made for Alex and James a few months back, I thought that another love embroidery was in order for Megan and Ben. I was inspired by a little bit of braid that's been kicking around in my family since I was a little kid, which depicts a couple of German folk-art people having a smooch. I absolutely LOVE it, and wanted to recreate it for a cushion. When I got to drawing up the design though, I thought "Why not make it actually Megan and Ben, instead of these random German dudes?". I was also inspired by my friend Jay's Christmas present to us, which was an outrageous little thing too tiny to photograph, so let me just say that it involved the most precious embroidered family portraits that are literally too cute for words. So I drew together all the little beauties floating around in my head, and came up with this. I reckon they're pretty cute! The tree fabric is a total winner from Alewives called Majestic Oak. Stunning. And perfect because the bride and groom are outdoorsy types, so I reckon the frame is like they're out walking in the woods, holding on to their flower-sprouting German folk-art Love. As you do. You can't really see it in the photo, but in the seam of the cushion I sewed some yellow rick-rack. Rick-rack is something I've always thought of as as being exceptionally cool, but have, weirdly, not used it that often. Well, I think the cushion has changed that. I can feel a complete rick-rack bender coming on, beginning with the waist band on the custom wrap skirt I finished this afternoon. The colour brief was "green, or with green in it". Unlike the last time I had a 'green' skirt order, when I was, for some inexplicable reason, totally devoid of green fabrics, I had in my possession this time round an excellent sheet which Pearl had picked up at an op-shop in Bega. Hooray! Also on order was a dress made out of a sheet (gotta love 'em), which is outrageously cool. The request was for a dress with contrasting sleeves and belt. I have to admit, I was a little apprehensive about this set-up, not sure that it was going to work. When I finished the dress, however, all doubts were allayed. I'm stoked! The third item in this trio of customised-ness was a remake of a dress which was 'not quite right'. This was really fun, given the outrageous level of cuteness contained in the vintage donkey fabric I used for the pockets. Unbelievable. Ah. The goodness. And now dinner's ready. A mostly-home-grown frittata. Like I say, I'm feelin' good. And why not, right? As long as there's love, vintage donkeys and home-grown produce in the world, there's gotta be something to smile about. Pearl took Oscar to the art gallery today, so it was just Olive and I at home putting in a stellar effort to get this little baby finished. I'm chuffed to bits. So chuffed, in fact, that I don't even know what to say about it, other than that it kind of reminds me of Cyndi Lauper. And the filmclip for 'Girls Just Wanna Have Fun'. The impression that filmclip made upon my tender little brain is impossible to overestimate, methinks. She was my first love (at the age of 5) and also the reason I started sewing. You don't get 10-year-old size Cyndi outfits just anywhere, you know? So as I was making this dress, even though I was listening to Grizzly Bear, Beirut, The Decemberists and the Black Keys, I was actually thinking of Cyndi, and all her colourfulness and netted petticoats. Well, since last I posted, a great many things have happened in our little house. I've been sewing madly, embroidering wedding presents (yes, I'm a glutton for punishment) and sewing up wedding frocks, amongst other things. Pearl has made a return to the paid workforce, which, apart from being very exciting (and slightly terrifying!) has called for the construction of a few new work outfits. Dresses namely, in a style I like to call The Pearl. I think it is such a fantastic, smart but still comfy, flattering dress, with some cute little details like pleats at the neck. The skirt is made from a totally amazing tablecloth that I've had kicking around for a LONG time, never quite knowing the perfect thing to make from it. The top is made from a leftover piece of Alewives fabric, which I didn't end up using when I made this bedspread for Pearl for Christmas. The dress, she says, makes her feel like Frida Kahlo. Add her brand spanking new goat leather satchel and a spunky old leather belt, and I reckon you've got one pretty good lookin' work-lady. Wedding dress progress is coming along very nicely, with my little friend Olive taking advantage of the excitement and staying up very late 'helping' me to cut it out. Oscar is also lending a hand in the form of his musical accompaniment to my sewing, and keeping Florence (the mannequin) company while she models the dress-in-progress. After my post about Megan's wedding doily bunting, I received a request for some personalised birthday bunting for a little boy called Louis who is turning 2! I reckon a birthday's almost as good as a wedding (actually, probably even better because you get to have one every year) so I was SUPER excited to get started on the flags for the little guy. As I mentioned in my other post, birthday bunting is an excellent and fun tradition. Unlike Christmas, which sees the same familiar and well-loved decorations making their annual display, birthdays don't usually have the same kind of 'festive' feeling. Enter Birthday Bunting, and you have yourself an instantly recognisable decoration which comes out every year to wish you (or your kids, pets, whatever) a happy birthday. Lovely. And I reckon you don't even need sewing skills to update the number each year, just cutting skills and maybe blu-tacking, double-sided sticky-taping or perhaps, for the punk-rockers amongst us, safety-pinning skills. I also like making bunting because it makes excellent use of pieces of leftover fabric that are too big to chuck out, but too small to make anything much out of. A few months ago I posted pictures of a bunch of fabrics that were finalists to be chosen as the obi waist band on a wedding dress I'm lucky enough to be making. Well, a choice was made, which led to the even funner choices of picking the co-ordinates. And here they are! The bride in question is a woman after my own heart - she loves bright colours. In fact, she loves them so much that the first shade of green I picked out was too light! But with the help of some online colour palettes I think (hope!) it's all sorted now. I'm pretty much in love with the colour combo - pink + green = awesome in my books. The style is to be a 50s-era halter dress, with a circle skirt and petticoat (hence the netting), with an obi-style belt similar to the one I made for Ally. How great! It's a beach wedding, and I reckon this dress is going to be super-cute in the sand. Doily bunting to celebrate the wedding of the year! As you may know, I love weddings. Massive sucker for weddings, right here. In fact, if I wasn't a bush regenerator/environmental educator/clothes designer-maker/part-time academic, I'd be a wedding planner for sure. I love making wedding dresses, and when I don't get to make the dress, as in the case of my friend Megan, who is eminently competent in the frock-making department, I lend my crafty skills in other ways, like making doily bunting! Originally Megan asked for "a few metres" to jazz up the house where she's to wed her beloved bearded bloke. But a few op-shop encounters in Bega, Narooma and Unanderra left me with a massive amount of doilies so I went to town and racked up more like a kilometre. OK, so that may be a bit of an exaggeration, but let's just say there's plenty. I first started making bunting when Olive turned one, and I made a Happy 1st Birthday Olive bunting. We change the number every year, so it's become something of a tradition. Then I started making name bunting for a little shop in Surry Hills. People would let me know their kid's name and I'd make up a set of flags for them. 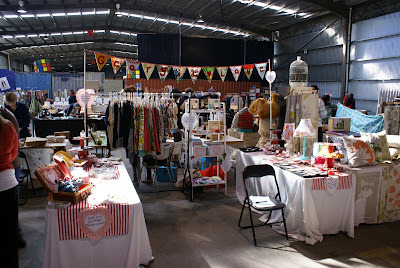 I recently also had the pleasure of making the name bunting for Georgie Love's stint and Melbourne Finders Keepers. And then at Christmas I made a few strings of bunting made from the bajillion doilies I've collected over the years. As many of you keen op-shoppers/crafters will know, doilies are out there, sometimes extremely beautiful, but not that useful. Megan was one of the lucky recipients of the Christmas lot and was quite partial to them, so I offered my services as official wedding bunting maker. Fun times! I can't WAIT to see them in action at the actual festivities (as opposed to the bamboo grove outside my bedroom door)... Now I just have to get started on the gift! In other news, I received two blog mentions over the hols, which I was pretty excited about, and wrote a blog about here. For some reason it came up in May!! I'm fairly unsophisticated when it comes to computers so I wasn't really surprised.